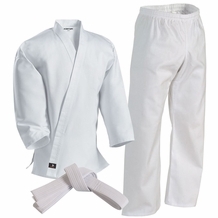 KUNG FU AND TAI CHI UNIFORMS sold at the lowest price, Guaranteed. Kung Fu and Tai Chi are the martial arts of China. The legacy of Chinese martial arts is the most diverse in the world with a wide array of styles and systems, both unarmed and with Kung Fu item. Kungfu uniforms are different from other martial arts uniforms because of their unique button "frog" closures and constricted ankle pants. 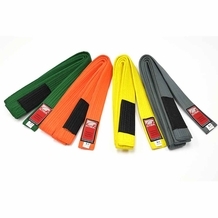 They are specifically designed to allow for the fluid movements kung fu is known for and have become extremely popular due to many Chinese martial arts movies. This uniform style is also commonly used in the art of Tai Chi and Wing Chun. 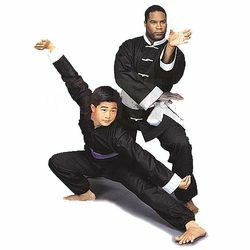 Whether you are looking for a Kung Fu uniform for your wushu class or just want a Kungfu costume for Halloween, Karate-Mart carries a great selection of Tai Chi and Kung Fu uniforms in many different styles and colors.